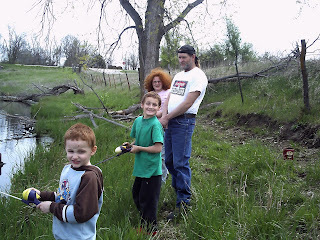 Went out to pamida to buy a fishing licenses so the grandkids and I and Grandpa can go camping this coming weekend. Billy and Denise will be in Topeka for a guard drill this drill is getting Bill prepared to go to Egypt. He will be leaving in June for summer camp and his orders will be extended to 18 months active duty. I think the boys and us old folks (ha ha) will be camping out at the old Sabetha lake for the weekend. Do some fishing and a fire roast some hotdogs and have a good time I do hope it is not raining. 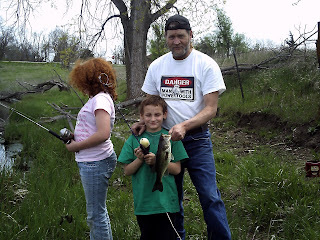 Last week we went out fishing the two older two vicyoria and elisha cought a bass jrssy felt left out he did not catch any. 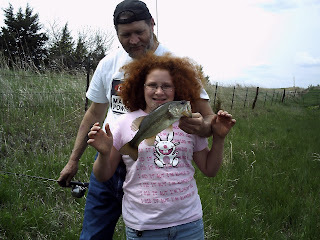 So i am hopeful we will all catch some fish this up coming weekend and have a great time camping.